Printer Comparison has tested a multifunction printer from HP with a pretty original feature. 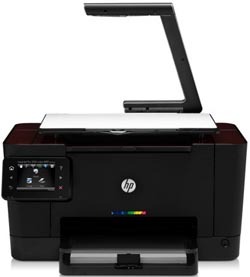 The HP TopShot LaserJet Pro M275 is able to do 3D scanning of objects. This sounds like a gimmick, but is it actually useful? Let us hear what the reviewer over at Printer Comparison thinks. Printer Comparison ends up giving the TopShot LaserJet Pro M275 an overall score of 3 out of 5 possible stars. The HP printer scores highest on print quality, a little lower on ease of use and operational costs, while it scores lowest on features. The 3D scanning part of the printer is actually quite good, but the reviewer finds it to be a bit useless. The print speeds are pretty slow especially color printing. Even though this is a very niche printer there might be someone out there that find this model attractive. Read the full review of the HP TopShot LaserJet Pro M275 multifunction printer with 3D scanning here.